Are you searching for a trusted name in Lake Barcroft landscaping companies? Complete Lawn Service is your full service landscaping destination. Whatever your outdoor needs, Complete Lawn does it all, from landscaping to lawn care to irrigation. Our team will design and maintain a beautiful landscape that increases your home’s livability and visual appeal…and adds to your home’s resale value. Landscapes/Hardscapes. Our landscaping arrangements are both eye-catching and sustainable, with a nicely balanced combination of plants and shrubs. Our hardscape designs range from elegant to natural, with strategically placed patios, walkways and water features. We also provide drainage services that eliminate flooding and erosion. Lawn And Plant Care. Leave the hassle of lawn care to us…we provide bi-weekly mowing and edging throughout the season, including bagging and recycling clippings. Our lawn care programs provide quality soil and remove weeds and insects for a vibrant, healthy lawn. And our varying shrub and plant care programs keep trees and plants growing and neatly trimmed for a truly stunning outdoor look. Irrigation. Our Certified Irrigation Designer determines proper watering for each zone in your property, and designs a custom sprinkler system that uses state-of-the-art components and eliminates wasteful runoff. Our maintenance service includes inspecting connections and adjusting sprinkler heads, and turning off the supply for the winter. Complete Lawn can repair or upgrade any system as needed. We also spray your property for mosquitoes and ticks too, with safe, naturally derived oils rather than chemicals. And in the cold season, we plow snow, shovel sidewalks and remove ice to help you or your business get going again. New customer? Get 50% off of your first lawn mowing or lawn maintenance visit! 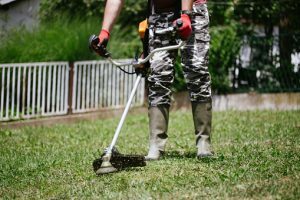 Contact us today for a free consultation and see how our professional experience sets Complete Lawn apart from other Lake Barcroft landscaping companies. We look forward to beautifying your outdoor space.